Aluminum wheel manufacturer Superior Industries International Inc. has named a successor to retired president and CEO Don Stebbins. 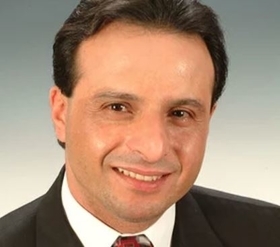 Majdi Abulaban, 55, comes from Aptiv PLC and will start his new role May 15, according to a news release. Chairman Timothy McQuay took on the top position on an interim basis while the company started an external search. Stebbins, a longtime automotive executive, officially left the company Dec. 31. Superior relocated its headquarters from California to Michigan in 2015 and opened a $125 million plant in Chihuahua, Mexico, under Stebbins. He joined as top executive in 2014 and exited with a retirement package worth about $3 million, Crain's reported. He received $5.9 million in total compensation in 2017, according to an Automotive News/Equilar CEO Compensation study released last year. Abulaban comes from a position as senior vice president for high-tech electronics supplier Aptiv and group president of the company's signal and power solutions segment, according to the release. Aptiv was created when the former Delphi Automotive spun off its traditional powertrain business. Delphi changed its name to Aptiv after the spinoff. The powertrain spinoff then became Delphi Technologies. Abulaban comes from a position as senior vice president for high-tech electronics supplier Aptiv and group president of the company's signal and power solutions segment. "Majdi brings to Superior a significant amount of operational experience in global leadership positions within the automotive industry," McQuay said in the release. "He has a demonstrated track record of creating value for shareholders, customers, and other stakeholders in his roles with Aptiv and its predecessor company." Abulaban started with Delphi in 1985 and has worked in finance, operations and as an executive, according to Aptiv's website. He has a bachelor's degree in mechanical engineering from the University of Pittsburgh and earned a master's at Case Western Reserve University. Superior grew net sales from $1.1 billion in 2017 to $1.5 billion in 2018. But the value of Superior's shares has dropped nearly 79 percent percent from a high point of $22.65 a share in late August 2018 to $4.76 as of Friday. The shares surged 16.4 percent on Monday, closing at $5.54.